I mentioned a couple of weeks ago that the season for tart cherries is fleeting. People who love tart cherries watch carefully for them at the farmers' market—they usually only make an appearance once...possibly twice...depending on the microclimates of individual growers. When they do appear you must be ready to use them...or freeze them...right away since they don't keep well at all. Since June is typically a busy month with work, I almost always freeze them...looking forward to the delicious cakes, pies, tarts, cobblers and/or crisps to come. 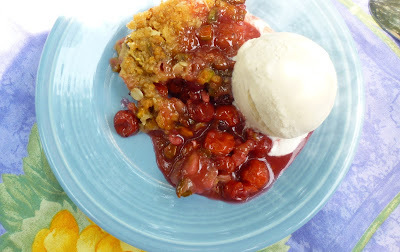 There have been years when I have bypassed tart cherries altogether during their brief visit to the market simply because I didn't even feel like I had the time to pit and freeze them....much less pit them and then make something with them. So it was this year. I'm not even sure I saw them when they came to the market. But then, in the midst of a busy week, a friend who has her own cherry trees showed up at the door of the classroom at The Merc in Lawrence with a big (4 lbs!) bag of beautiful tart cherries. Even though I was tired, you better believe I took the time the very next day to wash, pit and freeze them. And I was so glad I did. Within a day or two of freezing them I found out that there was going to be a potluck dinner in honor of some good friends who were going to be in town for a short visit. I thought a tart cherry crisp sounded like the perfect dessert...a special treat to share with some very special friends. If you have never frozen your own cherries, it is easy to do. First, wash the cherries in a couple of changes of water. Spread them on towels to dry. Then, remove the stems and discard any that are mushy or showing signs of decay. Pit them (I use a hand held cherry/olive pitter), making sure that you get all of the pits (you don't want anyone to break a tooth). Spread the pitted cherries on a rimmed baking sheet in a single layer. Place the baking sheet in the freezer. When the cherries are rock hard, transfer them to freezer bags. The cherries will keep well for a year...although, as with anything, they will be best if used sooner rather than later. The cherries can often be used directly from frozen, but frequently they need to be thawed first. One of the difficulties with thawing cherries is that they release a lot of their juices as they thaw. This can be dealt with by collecting the juices and placing them in a saucepan over moderate heat and simmering until thick and syrupy...or simply thickening the simmering juices with cornstarch....depending on the intended use. The reduced or thickened juices can then be incorporated into whatever it is that you are making. I have always thawed my cherries in a bowl. I noticed though in the recipe that I used as a template for my crisp that they recommended spreading the cherries out on a baking sheet to thaw. 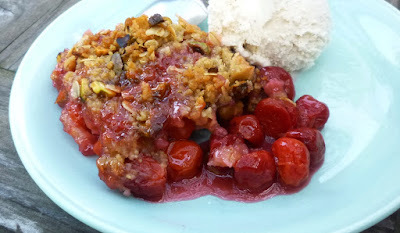 I followed these instructions because I knew they would thaw more quickly when spread out than they would in a big pile in a bowl (I was in a hurry), but I was surprised when the cherries only released about a tablespoon of liquid. I had even taken the extra step of spreading my cherries on a rack over the rimmed baking sheet in anticipation of all of the liquid they would release. Despite the fact that it wasn't necessary, I still think it was a good move. It made them easier to deal with since they weren't wet from sitting in the little liquid that they did produce. And if they had produced a lot of liquid, no further draining or drying would have been necessary. I don't know if the lack of liquid was a result of the fact that the cherries had only been frozen for about three weeks, or the method I used to thaw them...I suspect it was a bit of both. Either way, I plan on always using this method to thaw cherries in the future—it was fast, clean and there was almost no waste. Best of all, the cherries behaved very much like freshly pitted cherries when I used them. The recipe I adapted for my crisp was from Martha Stewart. 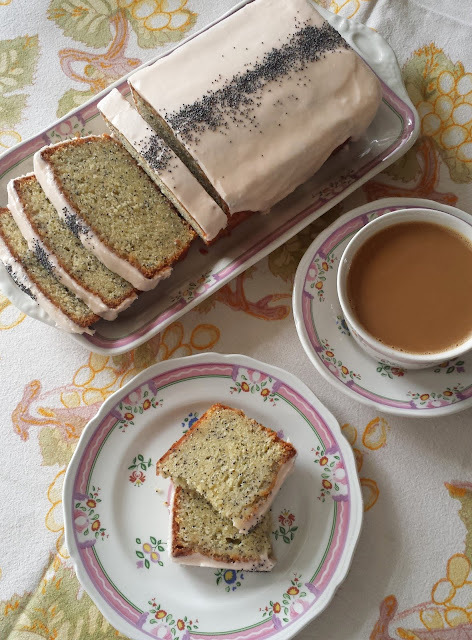 I was attracted to her use of pistachios in the topping. I love pistachios and was curious to see how they would pair with the cherries. I'm happy to report that they were delicious. I'm sure you could go with the more traditional choice of almonds, but I highly recommend the pistachios if you can get them (look for raw and unsalted in the bulk section of your grocery store). The crisp was a big hit with my friends...providing a satisfying end to a fantastic mid-summer meal of grilled meats and market fresh vegetables. I was so pleased I had the cherries to share. If you didn't happen to freeze your own cherries this year, you should make a mental note to purchase some to freeze when their season comes around next year. In the mean time, I'm certain this crisp would still be wonderful with purchased frozen cherries...and a perfect addition to your upcoming Independence Day picnic or barbecue. Combine the sugars, flour, salt and nutmeg in a medium-sized bowl. Rub in the butter until the ingredients are combined and have a crumbly appearance. 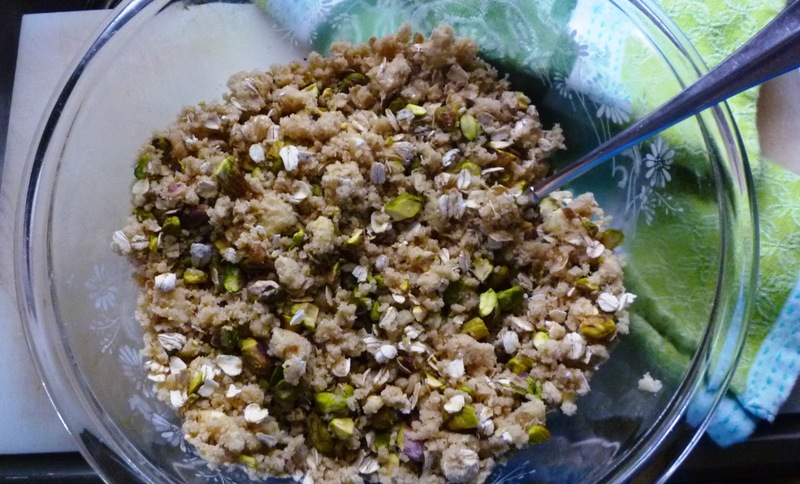 Stir in the pistachios and oats. Refrigerate until ready to use. Preheat oven to 375°. If using frozen cherries, spread them in a single layer on a rack set over a rimmed baking sheet. Let stand at room temperature until cherries have thawed almost completely but still hold their shape, about 30 to 45 minutes depending on the temperature of the room. Place the cherries in a large bowl. If the cherries have released a lot of liquid, pour the liquid into a small saucepan and reduce over moderate heat until thick. Cool and add to the cherries. If the cherries have released only a tablespoon or so of liquid, simply discard (or add to the bowl with the cherries). In a small bowl, stir together the cornstarch and sugar. Add this to the bowl of cherries, along with the almond extract. Stir until all of the cornstarch-sugar mixture is evenly distributed and moistened. Turn the cherries into a shallow, buttered 3-qt. glass, ceramic or earthenware baking dish. Bake until the topping is golden and crisp and the fruit is bubbling (at the edges and near the center)—about 40 to 50 minutes. Cool slightly and serve warm with vanilla ice cream or lightly sweetened whipped cream. Serves 10. If you prefer a sweeter crisp, add another quarter cup of sugar (white or brown) to the topping mixture. If you prefer a tighter, thicker fruit mixture in your crisp, increase the cornstarch by 1 to 1 1/2 t.